Maintaining a marine aquarium is a job requiring considerable attention and if the marine aquarium type is reef aquarium then it actually needs your full and constant vigil. Therefore, if you are not a serious and an experienced hobbyist but a beginner, you should better have easy to maintain members in your marine aquarium. One such low maintenance invertebrate of a marine aquarium is Anthellia Polyp or Glove Anthellia Polyp. This article tries to cover the various aspects of Anthellia Polyp. You may use the information for maintaining your marine aquarium with Glove Anthellia Polyp in it. Other names: Belonging to the Family Xeniidae, Anthellia Polyp is also commonly known as Glove Anthellia Polyp, Encrusting Polyps, Eight Tentacle Polyps and Green Glove Polyps. Coral Type: Anthellia Polyp is a hard coral with the hard coral type being Polyp. Origin or natural range: Indian Ocean and Pacific Ocean in Jakarta, Indonesia are the Glove Anthellia Polyp�s origination zones. Size: Anthellia Polyp is a few inches long. The size may vary according to the growth of Glove Anthellia Polyp. The growth and therefore the size of the Polyp vary, depending upon the depth of the marine water, the flow of water and the overall environment of your marine aquarium, etc. Color: Anthellia Polyp occurs in the range of brown, cream, tan and green colors. Morphology: Glove Anthellia Polyp closely resembles clove polyps. Anthellia Polyp has eight leaves like tentacles which are the key identification mark of the Polyp. Compatibility: Glove Anthellia Polyp is relatively moderately aggressive in comparison to the other marine invertebrates. Habitat: Glove Anthellia Polyp is colonial in nature. Its polyps grow aggressively to form a wavy mat like beautiful structure. Anthellia Polyp anchors its polyps on a hard surface. Aggressive corals attack Glove Anthellia Polyp. Therefore, keep it away from the other corals. Growth environment in your marine aquarium: The following factors should be adhered to for enabling a healthy growth of Anthellia Polyp. Temperature: Glove Anthellia Polyp requires the temperature of marine aquarium water in the range of 72 to 78 degrees Fahrenheit. 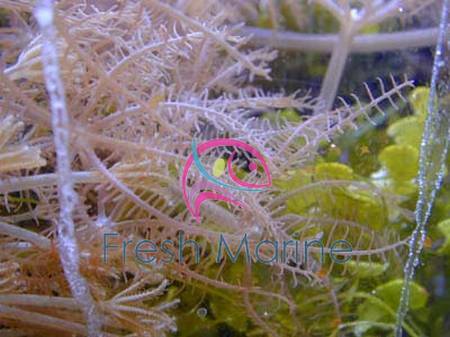 Specific gravity: Anthellia Polyp is comfortable with the specific gravity of the marine aquarium�s water in the range of 1.023 to 1.025.
pH: Glove Anthellia Polyp requires a pH of 8.10 to 8.40. Illumination: Glove Anthellia Polyp requires moderate illumination as the Polyp shares a symbiotic association with the photosynthetic algae, zooxanthellae. The alga lives within Anthellia Polyp. Water flow in the aquarium: Glove Anthellia Polyp requires moderate water flow. Marine aquarium habit & habitat: Anthellia Polyp is not deadly poisonous in nature. Glove Anthellia Polyp is rugged in nature and can recover from the shipping stress within few days to two weeks time. Fix the Anthellia Polyp on a square shaped aragonite plug. Then, place the Glove Anthellia Polyp in between the live rocks or in holes in your marine aquarium. Provide ample space to Anthellia Polyp to grow well. You will see that with time, the polyps of Glove Anthellia Polyp grow into a flexible mat like structure. This matty structure yields a stunning beautiful look to your marine aquarium. Feeding: Glove Anthellia Polyp is photosynthetic in nature and derives its nourishment mainly through this process. Anthellia Polyp may also filter feed a few times per week, upon acellular marine planktons that include both, zooplanktons and phytoplankton, and meaty bits. As supplements, please add Iodine and trace elements to your marine aquarium water. Care: Anthellia Polyp is easy to maintain as it requires less care. Caution: Although, the grown up matty look of the polyps of Glove Anthelia Polyp looks beautiful but, it may grow out of control and may grow on anything next to it, be it, a rock or any other coral.